The Isle of Man is no stranger to rain. The island’s unique topography and location will often see one part of the 37-odd mile Mountain course basking in brilliant sunshine, yet another endure a downpour. But by general consensus, the TT of 1971 was wetter, mistier, than most. 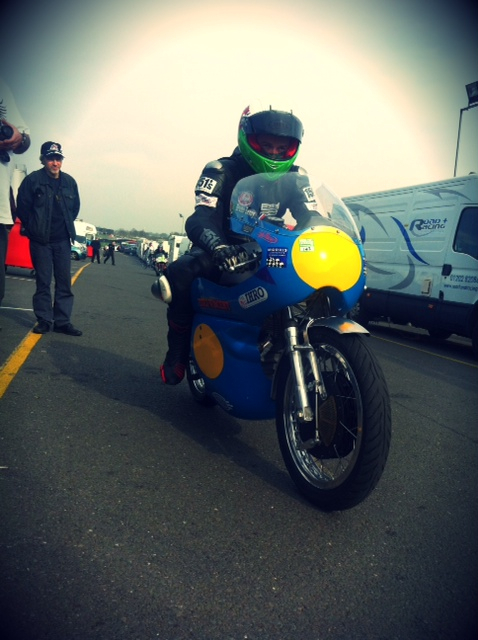 And it was the last time a Vincent-powered bike qualified for World Championship Grand Prix race. The Senior TT that year saw a 500cc Egli-Vincent – ridden by Roger Wittich and prepared by UK Egli-distributor Roger Slater – qualify for the Senior race with lap speeds of around 90mph. But due to weather-induced delays, Slater was forced to leave with the bike before the race took place. Now Patrick Godet aims to fly the Egli-Vincent flag again on the island, with plans to enter two of his freshly-minted 500cc racers in this year’s Classic TT. Riders will be his trusted pilot and development rider Bruno Leroy and up-and-coming talent Alex Sinclair. The chassis of the all-new Godet racer is based firmly on Fritz Egli’s original Comet powered Egli-Vincents he built in the late 60s. With a slightly shorter wheelbase than the twins, around 50 of these emerged from Fritz’s workshop. For the Godet bike, the only major chassis improvement needed has been work on the trademark oil bearing top tube, in order to keep the oil level constant under heavy braking. More work has gone in to the engine. The Godet racer features a plain bearing, one-piece crankshaft, vernier cams, 92mm bore x 75mm stroke, Nicasil liner and titanium con-rod to bring the unit bang up to date. A one-off, six-speed (you read that right) Albion gearbox transmits power to the rear wheel, which three dynos have now seen register a promising 54bhp. It’s some way from a cooking Comet. But it needs to be. 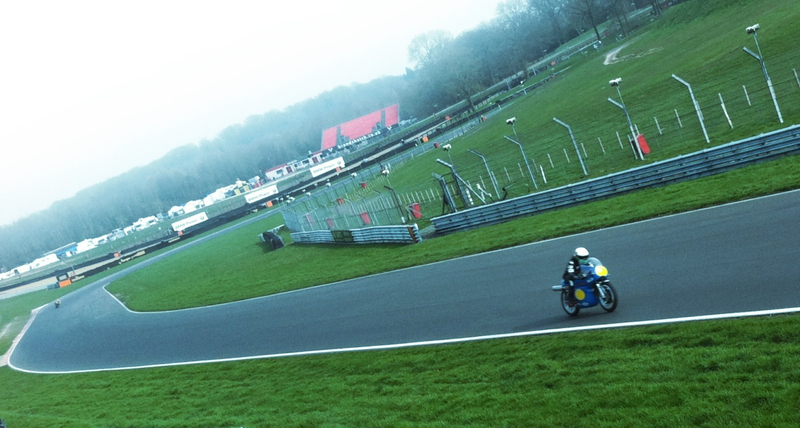 And so the Godet Equipe arrived at Brands Hatch on a brilliant spring day in March to give Alex his first ride on a Vincent. The Swindon-based 23-year old is no stranger to fast, competitive classic racing on British singles. Or to the Isle of Man. He was the first privateer home in the 350 Classic TT last year, and took third in the Lightweight Manx Grand Prix the year before, both finishes on BSA Gold Stars. With 39 wins, 61 podium finishes and eight lap records under his belt, it’s not surprising Classic Racer magazine has just featured him as one of the young riders to watch out for on the classic scene. Three problem-free, fast 40-minute practice sessions mixing it among modern racers later and it’s clear the Godet Egli-Vincent compares well to the Goldies. 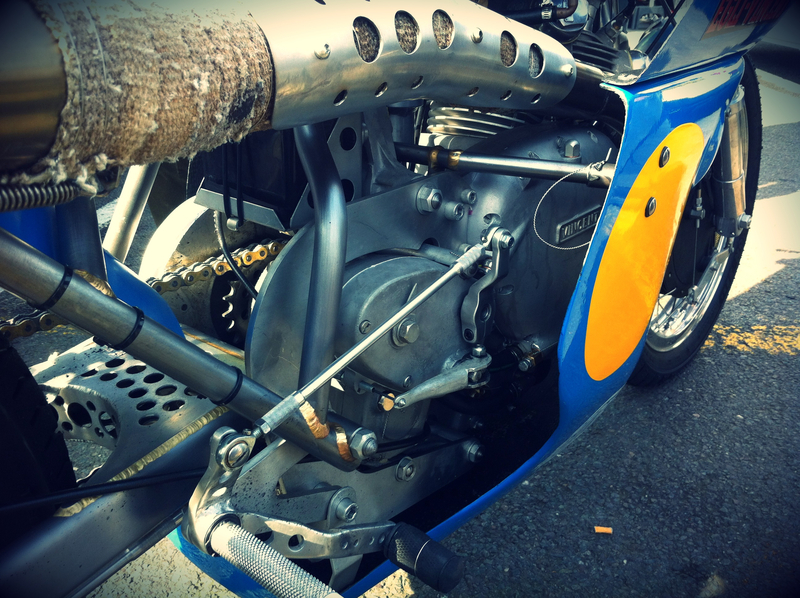 ‘More power than the BSA,’ says Alex with ‘loads of bottom end torque.’ Maxton suspension techies were on hand to offer advice on the rear units, particularly in readiness for the demands of the Mountain circuit. 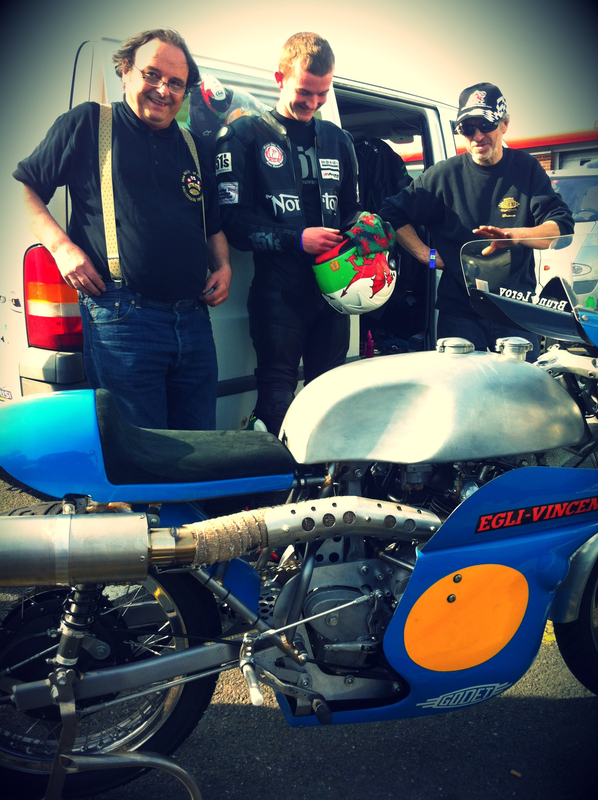 ‘With the right amount of development and plenty of track time the Egli-Vincent should be able to run with the Manxs and G50s and put on a good show,’ says Alex. 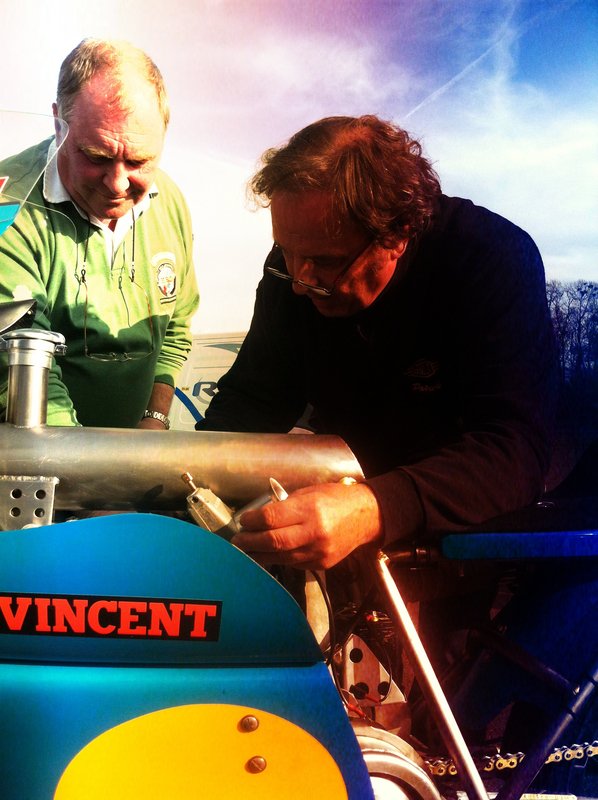 And so, over 40 years since the Wittich-Slater bike qualified for the Senior TT and over 60 years since Grey Flashes first walked the earth, a 500 Vincent will return to the Isle of Man. The aim, says Godet, is to ‘wave the flag’ for the Vincent marque. Will it be enough to compete against the Manxs and G50s? ‘We hope so,’ says Patrick, ‘but racing is not a certain business.’ With over six hours of track time under its belt, and a rosta of classic races booked in before August, it might not be certain. But it is hopeful. The engine is the continuation of his original ‘Ultra Short Stroke 500cc’ engine with a big bore Nicasil cylinder measuring (92mm x 75 mm). The engine is pulling over 54 HP at 7,900 rpm at the rear wheel. Sachsenring Germany 18th. May : as 2nd bike is not ready, the team finesse this event to favor Lydden Hill. 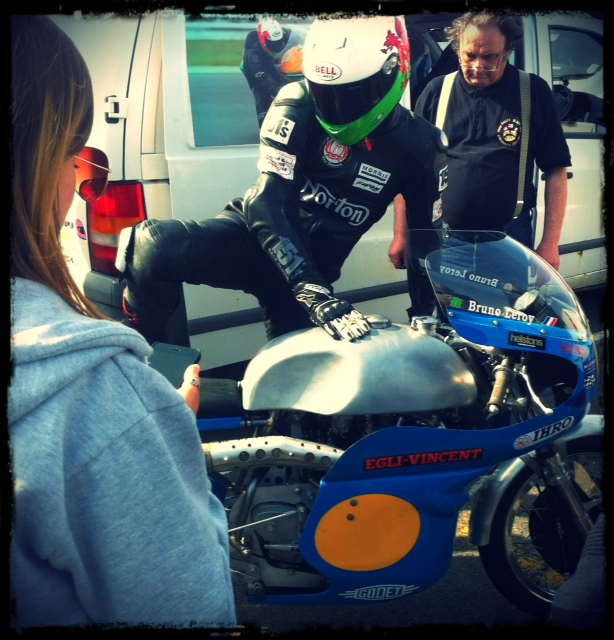 TT-Classic (IOM) Course 500 cc TT Classic senior race 23rd. Aug.
Next The Vincent-HRD and Royal Enfield brands to be unified under the same banner. 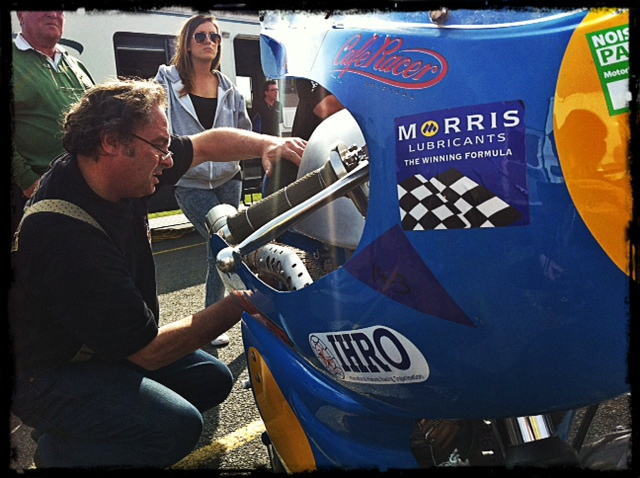 Hola Patrick & Bruno, still racing i see & a test at Brands– looks like a lot of journeying to do this season(as ever!). One point in your blog– the name Wittich came up. Was his christian name Ron(ald) from Luton ? One of my inspirators in my early proddie+endurance racing(1969-`74),he usually raced a norton commando but got to race the works Laverda SFC of dutch importer Raymaker/Reimersma until he crashed at Zandvoort 6hr.`72. 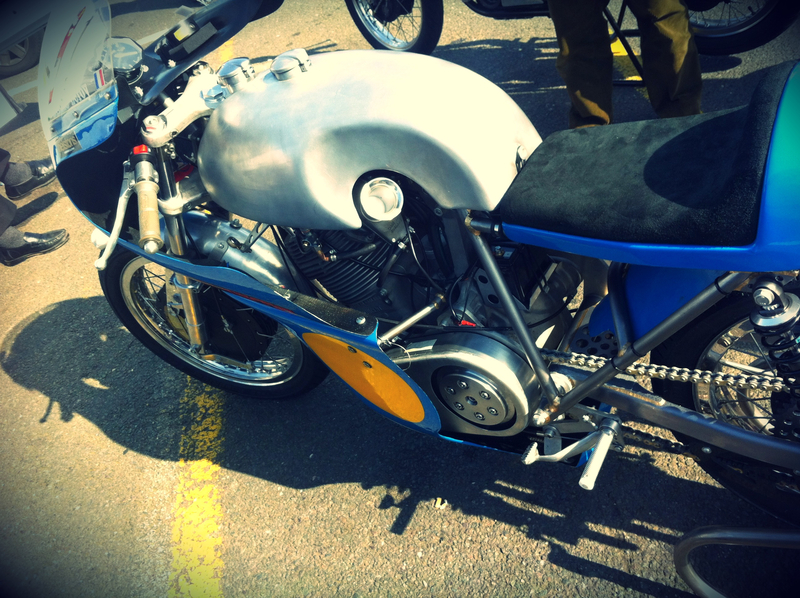 Also in the `72 Barcelona 24hr. 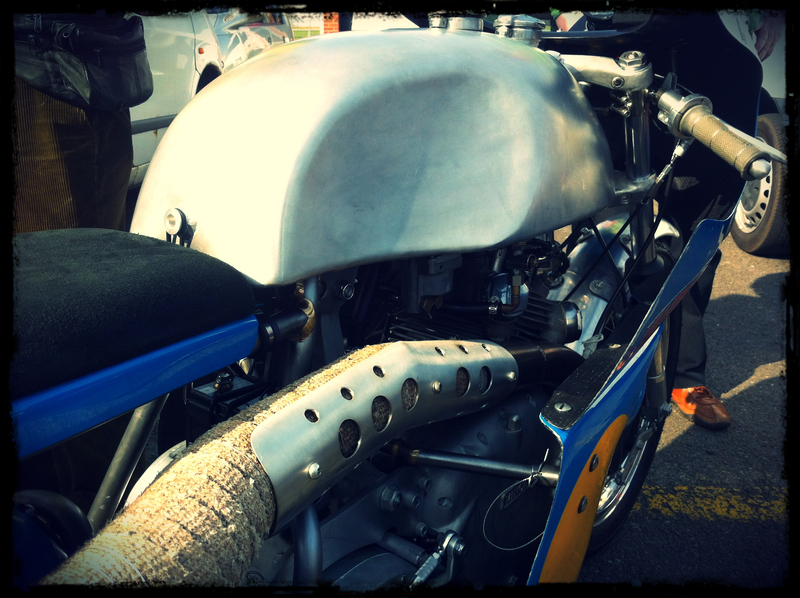 i was 2nd.last finisher to the 500 vincent of entrant Slater,so this could have also inspired you to develope the 500.